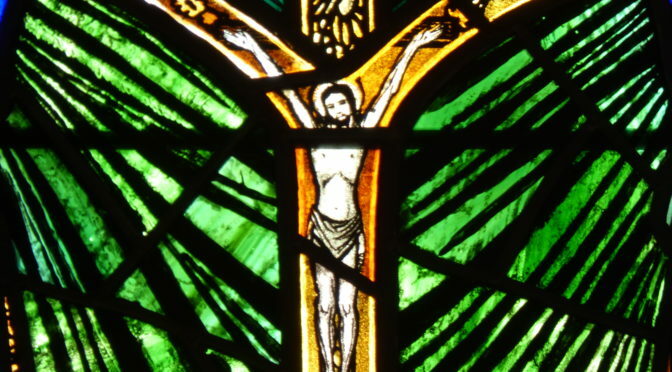 Mark’s account of Christ’s Passion is stark and straightforward. Jesus is abandoned by everyone. Judas betrays his friend to the chief priests. Peter, James and John can’t stay awake to watch with him in Gethsemane, and Peter denies three times that he even knows Jesus. The chief priests and the soldiers mock and jeer at him, and the crowd joins in – the same crowd that, a few days earlier, was shouting ‘Hosanna’ as Jesus entered Jerusalem. The only help that Jesus receives comes from Simon of Cyrene, compelled to carry his cross, and the only recognition is from an unnamed Roman centurion, who acknowledges him as a ‘Son of God.’ Jesus dies utterly alone, feeling himself deserted even by his Father. He has emptied himself completely in atonement for our sins. But the Father will raise him up. When we feel most alone and abandoned, or when we are tempted to despair at our sins, the Passion of Christ reminds us that God’s love and mercy reaches into the darkest places of our lives. God our Father will raise us up.